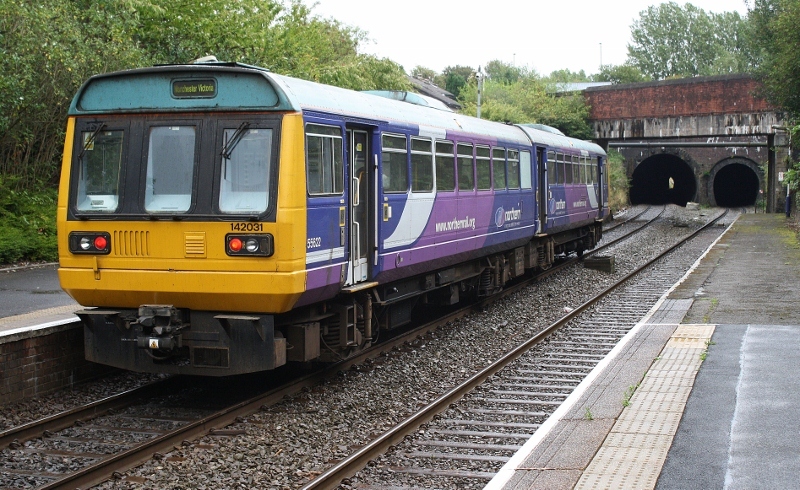 Martyn Hilbert's Railway Photography - Northern Rail - 142031 at Farnworth. Class 142, 142031 stands at Farnworth whilst working the 14.20 Wigan Wallgate to Manchester Victoria service on the 29th August 2011. The unit will pass into the 295 Yard Farnworth Tunnel on departure. The original double track bore on the left was completed in 1838, with the second single bore coming into operation in 1880, the original tunnel was then singled, to accomodate the passage of Midland Railway Rolling Stock which used the line between Manchester/Bolton/Blackburn & Hellifield to Scotland.